Best Music Theory App – 5 Reasons to Use It! Best Music Theory App - Learn 5 Reasons to Use It! This is the Best Music Theory App that REALLY Motivates Students to Learn - Without Them Even Knowing It. This is the Best Music Theory App that has Students Begging To Play It Again All While Retaining Music Theory Concepts Through Confidence-Based Repetition. Do you want the secret to making your students addicted to learning? Do you want to be part of the new technology that kids seem to learn faster than adults? Do you want to be the coolest teacher on the planet even if you can’t keep up with techie kids? If your answer is YES to any one of these… I’m going to tell you HOW… right now. You may have learned theory as a confusing and boring subject, but that doesn’t mean you have to teach it that way! A lot has changed since I was taught theory. Who knew we would learn how to READ, HEAR and UNDERSTAND Theory via a Music Theory App! Teachers have been begging for a Music Theory App to enhance learning with the Ultimate Music Theory Basic Rudiments Workbook, the Intermediate Rudiments Workbook, the Advanced Rudiments Workbook and the Complete Rudiments Workbook – and now you have it! We’ve partnered with Brainscape to develop the best Music Theory App that gives you efficient learning based on brain science. Now you and your students can learn faster than you can play… the Flight of the Bumble Bee. Here’s WHY this is the Best Music Theory App out there. 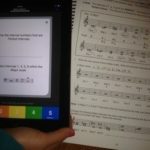 The Ultimate Music Theory App is the ONLY App with a matching Music Theory Workbooks. The Music Theory App builds knowledge through a step-by-step process of matching the learning from the 12 Lessons in EACH of the Rudiments Workbook with the corresponding 12 Decks in the Music Theory App. That is over 7000 Flashcards! CHALLENGING & FUN - At theory class, learning just became more fun! For Example: When you are teaching Basic Rudiments Lesson 5 on Intervals, use the Music Theory App - Deck 5 - alongside during the lesson. Students will be challenged with identifying over 100 Flashcards in Deck 5 - WAY more fun than a bouncing ball on a hot sunny day at the beach - and they won’t even realize how much they are learning! 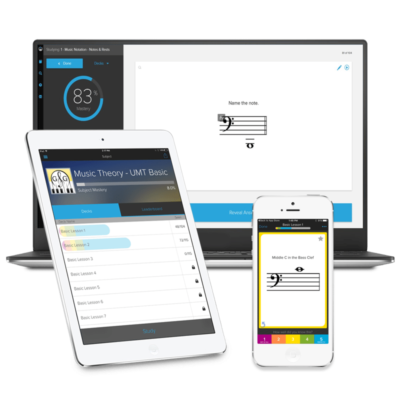 LEARN FASTER - The Music Theory App is powered by Brainscape, which intelligently processes each UMT Flashcard. The student identifies how well they know the answer on a scale of 1 to 5. Brainscape modifies the repetition pattern based on how well integrated the answer is in your student’s long term memory. Cool huh? DEVELOP SIGHT READING SKILLS - At the piano, have students Sight Read the Interval they SEE on the Flashcard and play it at the correct pitch. Then give the answer verbally and then tap to see the correct answer. Use this for scales, triads, ledger line notes, etc. BUILD EAR TRAINING SKILLS - The Early Bird: Do you ever have a student show up several minutes before their lesson time? Hand them the Studio iPad and let them build their Ear Training Skills by listening and identifying the Major, minor or Perfect intervals and more! EXPLORE MEMORY TECHNIQUES – At Home or On the Go – Encourage students to Purchase the Music Theory App so they can explore all 1300 Flashcards at home or On the Go. Hear exact pitch of notation and correct pronunciation of Italian terms and more! Improve learning through exploring memory techniques. 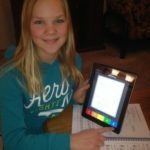 When using the Best Music Theory App – Basic Rudiments along with the Basic Rudiments Workbook, you are reinforcing knowledge in a new way that combines learning faster with advanced Ear Training and Sight Reading skills. P.S. 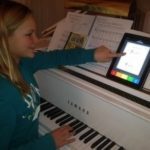 Don’t be left out of the Music Theory App World - Learn Faster, Build Skills and Explore New Ways to Have Fun in Class! 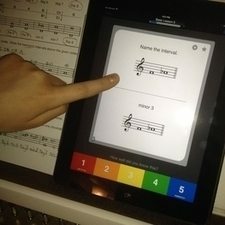 "I love using the Music Theory App with my Basic Rudiments lessons. It's SO much fun to hit # 5 - Know Perfectly!" - Shavaughn - Basic Rudiments Student and UMT 100% Club Member for Preparatory Rudiments. P.S. Join the conversation - Enter your comments, questions or ideas on using the Music Theory App Flashcards below.